PALMETTO, Fla. – Indicative of its extensive collaborative relationships, Port Manatee has hosted more than 100 Florida Fish and Wildlife Conservation Commission law enforcement division officers – plus four canines – from a 12-county area at the state agency’s annual meeting. The meeting, held today [Friday, Feb. 19] at Port Manatee, featured refresher training regarding endangered species and species of special concern. The FWC is responsible for protection and management of more than 575 species of wildlife and more than 700 native species of saltwater and freshwater fish, balancing these species’ needs with those of nearly 19 million residents and millions of annual visitors with whom they share the state’s land and water. 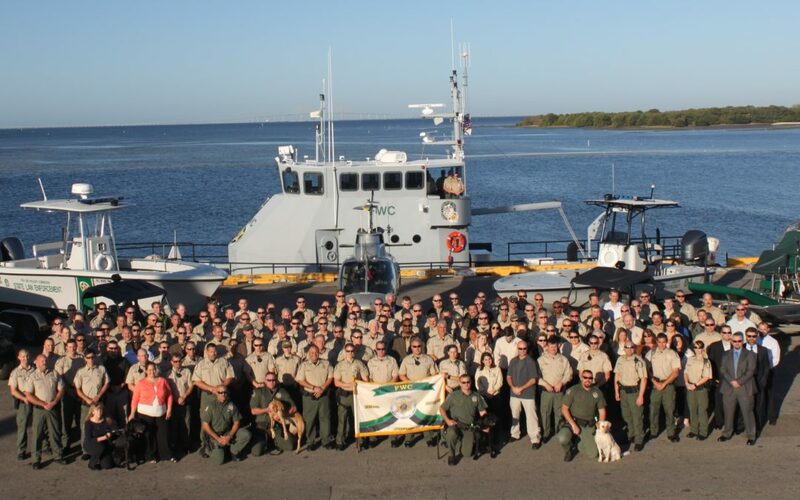 More than 100 officers of the Florida Fish and Wildlife Conservation Commission, along with four canines, pose with an agency boat at Port Manatee. “We are very pleased that FWC once again chose Port Manatee for its annual venue. It shows the high level of partnership and cooperation that exists between Port Manatee and the FWC.” Located “Where Tampa Bay Meets the Gulf of Mexico,” Port Manatee is the closest U.S. deepwater seaport to the expanding Panama Canal, with 10 40-foot-draft berths serving container, bulk, breakbulk, heavylift, project and general cargo customers. The port generates more than $2.3 billion in annual economic impact for the local community, while supporting more than 24,000 jobs, without levying ad-valorem taxes.